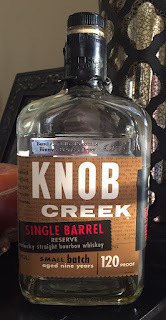 Binny's selected eight different private barrels from Knob Creek a short time ago. When they first arrived, I stopped by one of their stores and just stared at the eight different bottles, so overwhelmed by the options, not knowing how I could possibly pick one, that I ended up just grabbing an Old Scout private selection. About a week later, though, they provided a card with tasting notes on each different barrel and, while tasting notes are certainly subjective, it at least gave me some kind of comparison between the barrels and a basis to make a decision. I settled on a bottle that was not only well aged but was described as a "big" and "bold" bourbon with heavy notes of vanilla. Those were the magical words I needed to read to decide upon this barrel. Immediately upon opening the bottle I knew I had some firewater. The label doesn't change with these private barrel selections, so it still indicates that it's 9 years old and 120 proof. I guess these are floors, as this one seemed to be significantly higher proof than 120, and closer to the 130 proof range like Stagg, Jr. or Elijah Craig Barrel Strength. The flavor is heavy caramel, which overwhelmed the soft vanilla and oak flavors. That caramel seemed to transition to a nice mocha flavor. It was like a dark chocolate and caramel candy bar that burned as you ate it! I added a little ice to try to cool it down and see if it would open up. The little bit of water did seem to sweeten it up on the front end, but even more surprising, a nice rye spice then really came through on the back end. In this respect it reminded me a lot of Stagg, Jr. and ECBP. It required some work and some patience, but behind the high proof is a very good bourbon. All in all, I was very pleased with my selection. 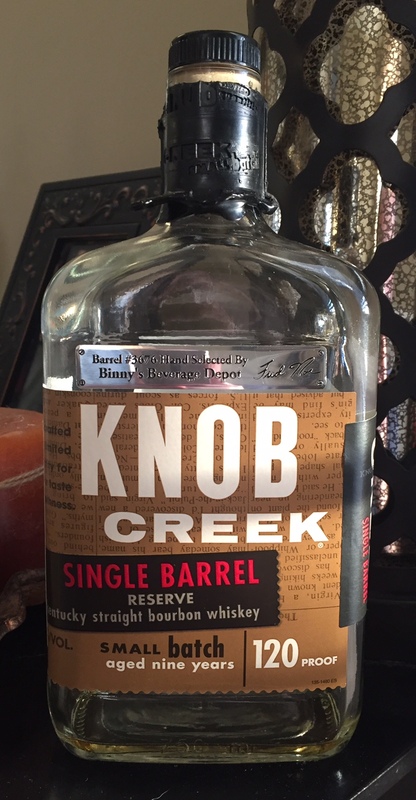 For what it's worth, for anyone reading this blog, if you ever get a chance to purchase a Knob Creek Single Barrel Reserve private selection, do it. The price is always very reasonable ($35-40), and I have yet to get anything other than a quality bourbon. In fact, one of the best bourbons I ever had was one of these private selections. Bonus Mini Review: My neighbor purchased another one of these eight private selections - Barrel #3674. He studied the tasting notes and was sold on the description that it had a sweet, nougat flavor. Sounded delicious to me as well. The biggest difference between the two was the heat. His bottle was significantly cooler. The flavor profile was significantly different as well, though. While my bottle tended to be the more traditional flavors (though in very bold fashion), his bottle had a more unique, sweet and nutty flavor. It tasted like honey roasted pecans, and was smooth as butter. I begrudgingly had to admit that I liked his more than mine. Luckily for me, though, he was more than generous in sharing his selection.